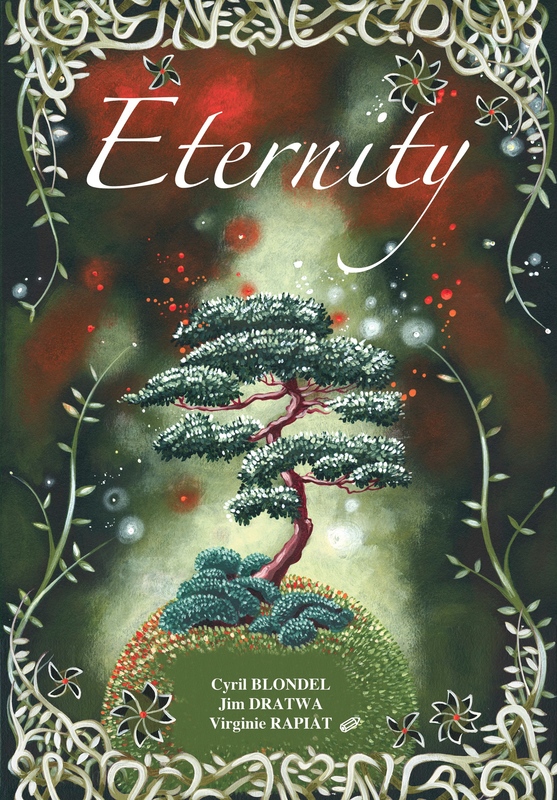 Eternity is a beautiful card game about planting sacred trees to keep the balance between Sky, Earth and Sea. Don’t let its beauty or serene goal deceive you, however, keeping the balance in this trick-taking game is no easy task when others are trying to do the same. Each player gets a hand of cards divided evenly, and they need to use those in a clever way to win tricks (a trick, simply explained, is one card from each player each round). To win a trick, they need to play a higher card of the same suit (Sky / Earth / Sea). If they cannot, they must play a trump card; the trump suit is determined by the strength of the trees. More on that later. The winner takes all cards, which together make a peninsula. The alternative to playing the trick is pledging to plant a tree, which uses up a card but does not include it in the trick. This gives an amount of tree tokens to the player equal to those shown on the card. The trees can be immediately (at any point) placed on an empty peninsula, one per peninsula. There is a limit of pledges depending on players. Peninsulas with trees on them give points, and players get extra points, a harmony bonus, if they have the exact same amount of trees as peninsulas. One last thing to explain: regardless of the amount of players, there will always be two extra cards when dealing. Those are set up on the central board and determine the initial trump. The suit with more cards on it is the trump. If there is a tie, Sky beats Sea and Earth, Sea beats Earth. The trump will always be changing, as any card pledged will go to the center at the end of the turn and upset the balance. Eternity captures the essence of traditional trick taking card games, the ones you play with a standard deck, and pushes the tension to its limit, creating an engaging, complex gameplay. A lot of strategy and planning goes into every move, which is not everyone’s cup of tea. Those who enjoy it, like I do, are in for a treat. The theme and art are gorgeous and add quite a bit to the experience.